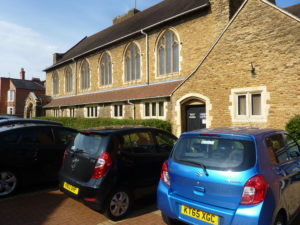 In 1901 the congregation of the King Street Chapel in the centre of Northampton, with the minister, Reverend Larkman, decided to move away from the town centre to a new location in Abington Avenue on the outskirts of town. At this time much of the population was moving away from the town centre to the newly developed houses in areas such as Abington. A plot of land in Abington Avenue was bought for £1,000 and the schoolrooms were built at a cost of £3,500. For the first ten years these rooms were used both as a chapel and Sunday School. When sufficient money had been raised the foundation stone for the new church was laid and within 12 months the building was complete. A Service of Dedication was held on September 1912. In 1921 a large stained glass window in memory of those who had lost their lives in the Great War was installed. In 1926 Reverend Larkman who had been the minister for over thirty years and had been instrumental in the relocation of the Church retired and the new minister, Rev Russell, inducted. 1930 saw the start of the ministry of Rev. Llewellyn Ellis. He started several initiatives that brought new people, particularly young people, into attending the church. In 1933 an organ was installed and a service of dedication and celebration held at which professional musicians Mr Thalben-Ball &Mr Howard Fry took part. In 1939 Rev Owen Butler, a student minister, was invited to become our minister. His first service was on 3rd September 1939 and during the service he had to announce that war with Germany had been declared. In 1952 Rev Fred Holley started his ministry at Abington Avenue. He suggested several changes to Church services including ‘family worship’ for Sunday mornings and the Young peoples Fellowship taking part in the Evening Services. In 1955 Junior Church was started, with children leaving the main service after 20 minutes for their own departments, a format broadly followed to this day. In 1961 Reverend Lloyd Jenkins became the new minister. 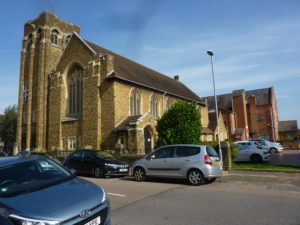 He fostered closer links with Churches in the vicinity, in particular with Adnitt Road Baptist Church and Christchurch C of E. The ministers of the three Churches preached at each others Churches, held joint discussion and Bible study groups. In 1968 a milestone was reached when, for the first time, Church membership had risen above 300 and the Junior Church register stood at 160 with 29 members of staff. In 1970 Reverend David Wilson became the minister at Abington Avenue Congregational Church. In 1972 The Act of Union took place. This joined together the Presbyterian and Congregational Churches. After due consideration the Church voted to join the new United Reformed Church. In 1985 Rev David Wilson left and Rev Dennis Hegginbotham became interim moderator. This was the third time he had taken on this role at Abington Avenue since 1962. Reverend Peter Flint became our minister in 1987. He and his wife Judith and their young family moved into a new manse within cycling distance of the Church. Our Church rooms had remained more or less unchanged since 1901 and Peter Flint’s ministry saw the start of a major period of redevelopment of our buildings. After five years of fund raising and building work, of which much was done by our own members, the old schoolrooms had been refurbished into rooms ideal for us to carry out our outreach mission work in the neighbourhood. In 1994 Peter Flint told the congregation that he would be leaving to become minister at St Paul’s URC in Bracknell. In 1995 Rev Mark Westerman became minister. During his ministry our mission to young people and the elderly flourished with many using the church rooms. In 2001 we marked the centenary of Abington Avenue URC. One of the events was a breakfast at the Moat House Hotel, the building that is on the site of the original King Street Chapel followed by a walk of about 3 miles to Abington Avenue for a Centenary service. During Mark’s ministry it was decided that we should embark upon a further development of our buildings and after yet more fundraising we weer able to completely modernise the sanctuary. In April 2007 Mark Westerman retired from the ministry and in October 2008 Rev Dr Alan Spence was inducted as our minister. In 2013 Alan moved to become minister in Broadstairs. In January 2015 we were extremely pleased to induct our new minister Rev Jane Wade, who has been minister at Hemel Hempstead for 17 years, as minister at Abington Avenue (with oversight fro Paulerspury URC). We are looking forward to this new chapter in the history of the church at Abington Avenue begins.